As a dog owner, that fearful moment when your dog takes off is frightening. A lost dog is a frightened dog; unaware of it’s surroundings and fearful of those they don’t know. It can happen at any time of day or night. But here’s where DDG can help to find your lost dog. 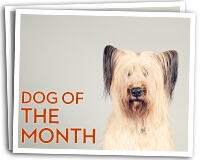 Hey Everyone; say hi to our gorgeous Golden Retriever Waffles; the November 2016 Dog of the Month. Dog Day Getaway is pleased to announce we’re again sponsoring The Great Minnesota Pet Food Drive. Please take a moment to help a pet in need. Drop off food, pet supplies and even money to help our local pet shelters.